Let Me Finish! 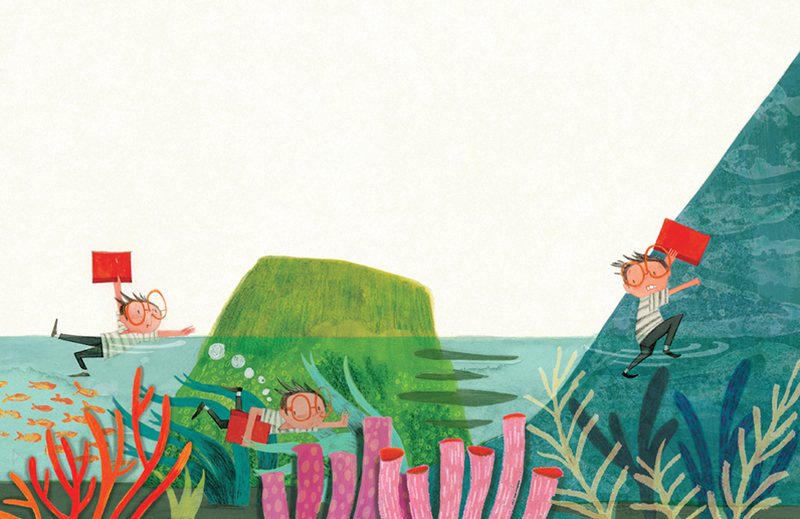 by Minh Lê, illustrated by Isabel Roxas (2016). Could there be a more perfect summer reading tribute? 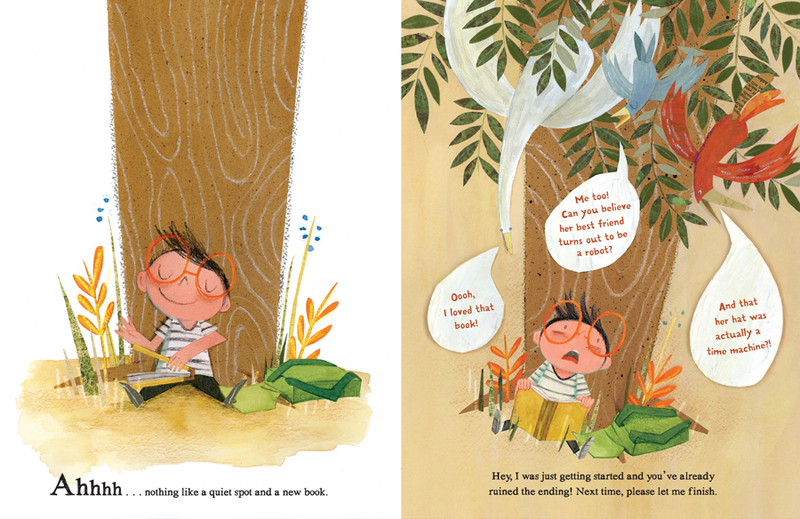 This picture book is about the joy of reading—alone. Only in this case, the main character can never get to the alone part. That’s because this lively, clever story is full of spoiler alerting animals. Without the alerts and just the spoilers. Any reader can relate. All the boy wants is to dive into and finish his book without being disturbed. But no matter how hard he tries, some animal who loves to read comes along and spoils all the juicy parts. So he finds an unspoiled book and sneaks away. But things don’t go as planned. Can we talk about Isabelle Roxas’s illustrations? The oversized glasses. The grape rhino. 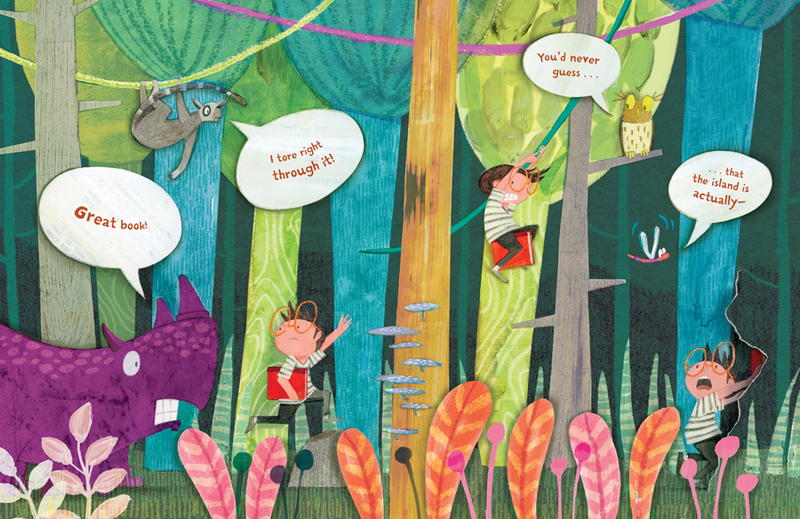 In a cave, in ice, or in a jungle, the colors and patterns pop on the page. And the hide and seek animals! There’s more to those yellow tree trunks than at first meets the eye. There are so many storytelling details like that. The art starts in muted, earthy tones of yellow and brown. And when things get going, when something crucial changes, the palette turns to blues and purples. There is so much style and substance in this artwork. That dragonfly there? He’s important. He’s the only one who doesn’t get to give anything away. But if he’d finished his sentence, he would have. Let’s just say our main character is about to engage in the story in a pretty big way. 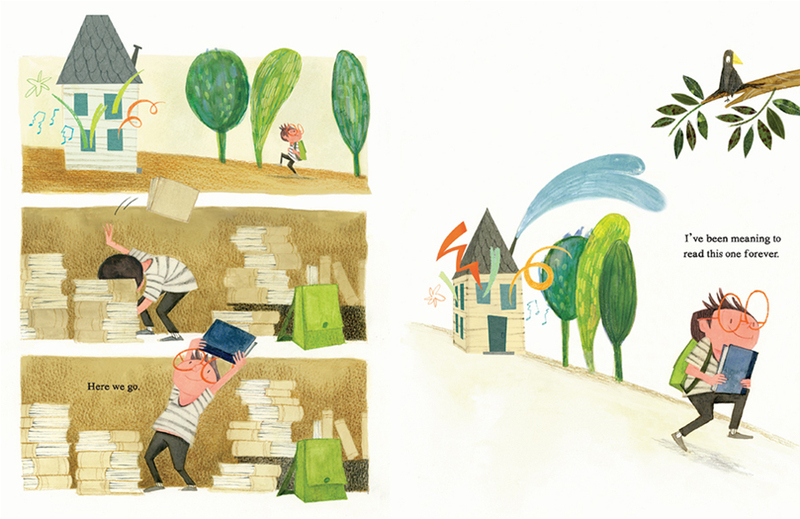 This book celebrates the way reading can be an immersive experience. You might just get soaked. Thanks to Isabel Roxas for images! You know what every reader needs? Reading glasses. And not necessarily the kind that help you see better. The kind that let everyone know you’re reading alone and not to be disturbed (or have the story spoiled). 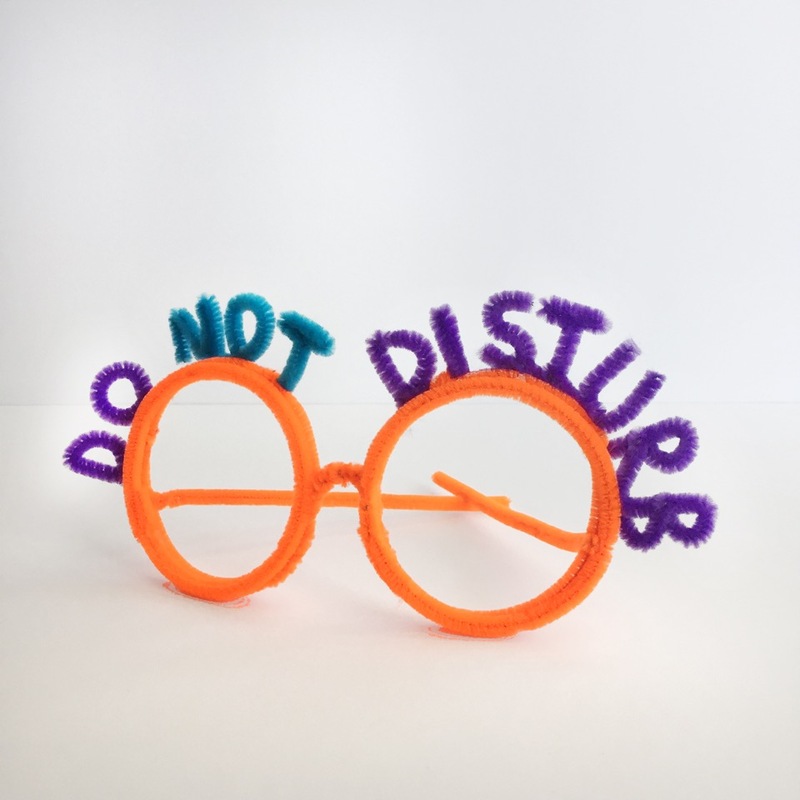 So, I give you pipe cleaner Do Not Disturb Glasses! All you need is pipe cleaners, that staple of kids crafts, and a pair of scissors. Then, shape and bend and and twist and cut away! 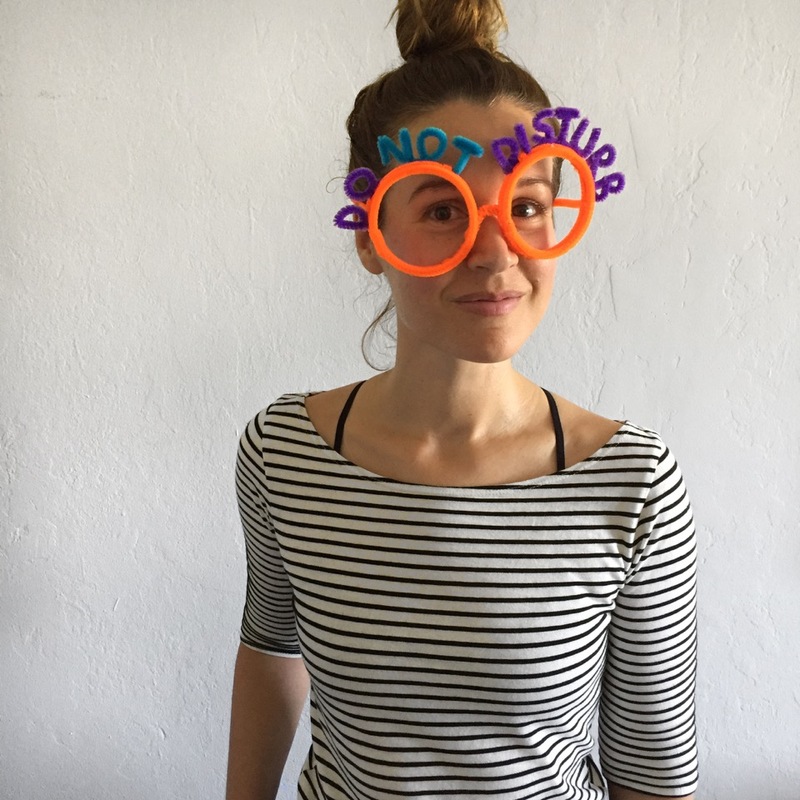 A kid can make the glasses while a grownup is probably better suited to make the letters (and make the cuts). But anyone can wear them once they’re done! You can even custom-size a pair to its owner. One tip is to connect the letters to one another to form a kind of base/underline. That way, you can more easily twist them onto the glasses. 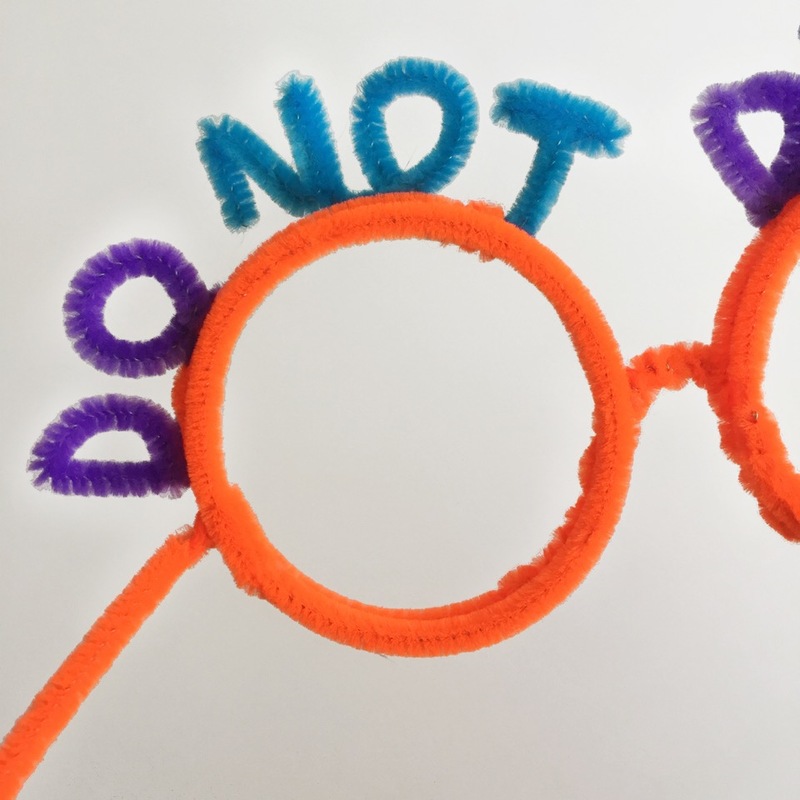 Another tip—the round lenses are actually a double layer of pipe cleaners in order to keep the front edge tidy, not showing the fastening of letters to lens. Big thanks to my dude, Todd Davis, for crafting the glasses with more finesse than I could ever muster. Here’s to soaking up the rest of summer reading! 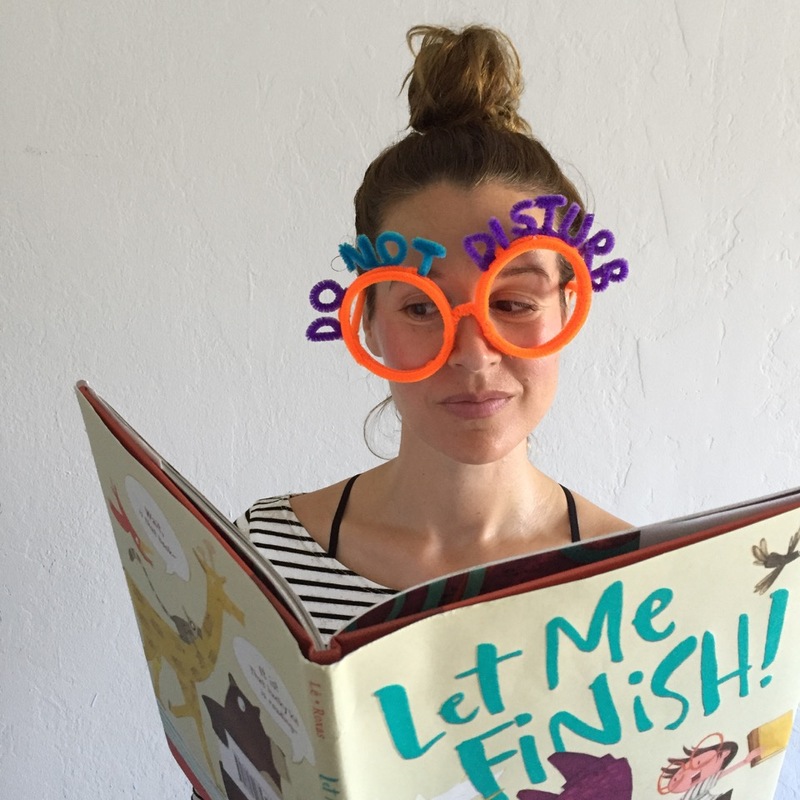 read the book, make reading glasses! 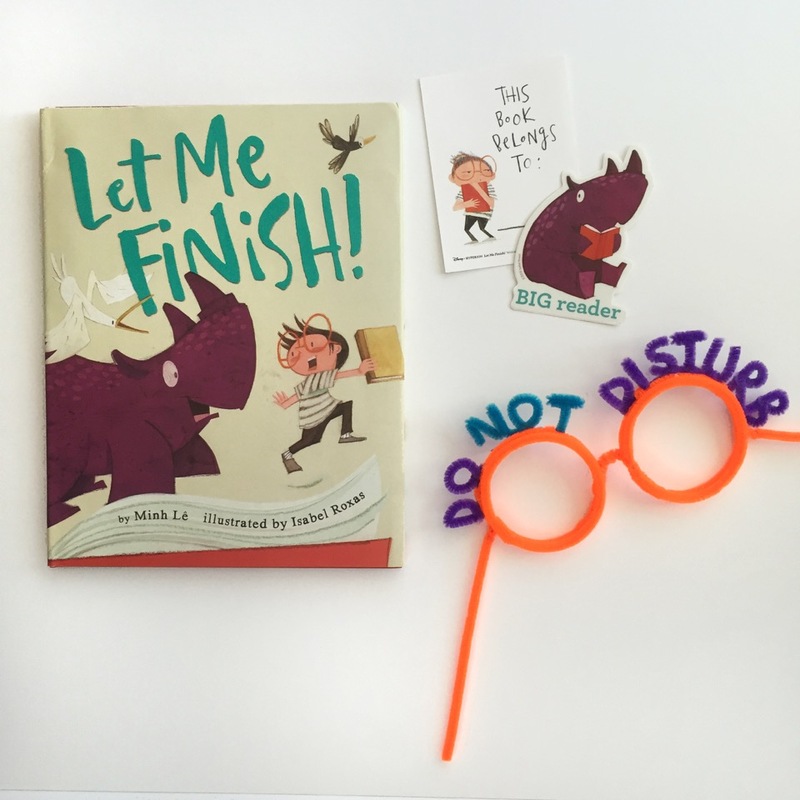 ← this picture book life turns three + giveaway! Woo hoo!! It was my pleasure to play around with such a wonderful book. Congratulations! haha, I love the glasses! This book looks super cute. 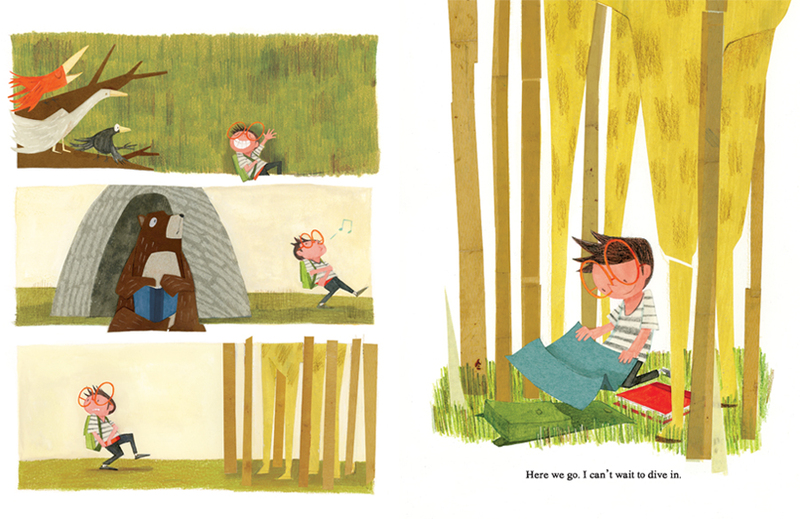 I just FINISHED the complete Little House series this summer (about a week ago) and I feel like….I need some time off now from read-alouds. It took us 7 months, and the kids loved it, but hoo-boy, I can’t wait to do another stand-alone, before we get started with a series again!! 🙂 So glad we read them, though. I love books about reading! The Do Not Disturb Glasses are so clever! Thanks for a great post! Really cute! I would want to wear those specs for everything though…cooking, watching TV, reading, drawing, napping…oh yes, napping definitely. How cute are you in those specs?! I would wear those on the MBTA so I could commute in peace. Why is this book not yet on my shelf? Must have! Oh my goodness, those illustrations. Can’t wait to read this one. I just started reading Mango & Bambang The Not-a-Pig by Polly Faber and Clara Vulliamy with my girls. It’s such a fun read!!! I love this book! Can’t wait to read it to the kids when school begins. I think I might find big orange clown glasses and add the phrase. Yay!! Excellent idea for a craft hack! Love this book! I requested it from my library and enjoyed it so much! This book looks so darn cute! You’re so right about the illustrations, too. Hahaha. Here’s to reading in that special, undisturbed place once in a while! How adorable, both the story and those awesome glasses! a magical new twist on Pinocchio that has a steam punk vibe. Wow—your summer read sounds fascinating! NEED this book. NEED those glasses. NEED time alone to read. The book’s concept is so clever! Certainly a plot technique that adults can enjoy, too. I just finished White Bone by Ridley Pearson. It’s a suspense fiction with a conservation message. This book and these glasses! So much love. Two books I’ve read this summer that I loved: Wolf Hollow and The Serpent King. My to be read pile is a mountain these days, but at least I still have a chunk of summer left to squeeze in more time to read! Love the pipe cleaner craft! Have to try this at my prek-5 library. P.S. : I’m reading PETUNIA by Roger Duvoisin. Over and over and over again. Love the book and the glasses! Would love to share them big with students this fall! I’m currently reading nine, ten. Some of my other favorite reads this summer are Save Me A Seat, Wild Robot, Seventh Wish and Ms. Bixby’s Last Day. This looks awesome! I am already ordering this book for our school library and this would be a fun activity for our Makerspace. I Ifinished Raymie Nightingale and The Crossover (both amazing!!!) and am starting an adult book tonight, Liane Moriarty’s Truly Madly Guilty! Can’t wait for Harry Potter and the Cursed Child next week either! This picture of you in the glasses makes me absolutely smile! LOVE! I am excited to get my hands on this book. Keep hearing fantastic things. And, I so appreciate the sentiment of this story. Thanks, Carrie. I had so much fun with this—the book inspired! Funny, right now I’m sitting at a shared table with Isabel, in Cambridge, watching her work… It’s pretty amazing! Such a treat to be with her in this class. I’d love to get the book! Thanks for this chance to win this intriguing book for my school library. Love the pipe cleaner maker craft. Will be using it for sure! This book looks amazing and I’m not sure I would have heard of it if I didn’t follow your blog. After a year of reading non-fiction (albeit, fascinating non-fiction,) I plan on re-embracing my love of magical realism with Ocean Sea and Invisible Cities. Of course, if you meant children’s literature, I would mention that my daughter and I are tackling Rootabaga Stories by Carl Sandburg and The Iron Man by Ted Hughes. What fun! This book will so resonate with my family. Thanks for an amazing post.